Lock in a great price for Holiday Inn Hotel & Suites Chicago - Downtown – rated 8 by recent guests! The staff was very friendly. The restaurant at the hotel was good, for breakfast and for supper. The valet parking was great and got my car quickly. Great value and great location for one night, for the Credit Union 1 Arena and many other area sites. Despite the parking concerns, Lyft/taxi are available. The room itself, though obviously old and not modern, was actually quite nice and spacious. The hotel is within an extremely short walk from some nicer parts of town. Great location, convenient because it was very close to where I had to go for my appointment,overall great experience would definitely be back! Comfortable bed. Good location. A metro and bus station close to the hotel. Although in the street was extremely cold but in the room was absolutely warm and cozy. The room was clean, and had every you expect on an hotel in this category. The room was clean and comfortable and had enough room. The bed was comfortable and big enough. Staff was friendly for the most part. I really just needed somewhere to lay my head for the night. I had an 11hr layover on my way to Atl and didnt want to be in the bus station all night. It was right around the corner from the Greyhound station so it was easy to access. MOST COMFORTABLE BED I'VE EVER SLEPT IN. 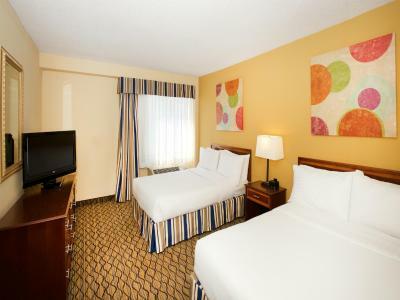 Holiday Inn Hotel & Suites Chicago - Downtown This rating is a reflection of how the property compares to the industry standard when it comes to price, facilities and services available. It's based on a self-evaluation by the property. Use this rating to help choose your stay! Only a few blocks from the Sears Tower, this downtown Chicago hotel features an on-site restaurant along with comfortable rooms and thoughtful on-site facilities. Guests at the Holiday Inn Chicago Downtown can enjoy on-site dining at Sunny's Restaurant and Lounge for breakfast, lunch, dinner, or as a room service option. Sunny's Restaurant serves American cuisine and has seasonal weekly specials. The hotel also features a seasonal outdoor swimming pool along with modern fitness facilities. Popular area attractions, including Greek Town and the University of Illinois-Chicago Campus are located close to the Chicago Downtown Holiday Inn. 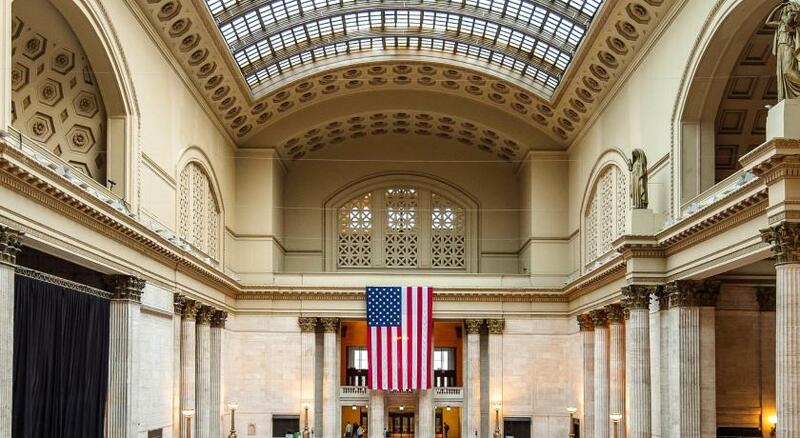 Shedd Aquarium, the Magnificent Mile and Navy Pier are also easily accessible with nearby public transportation systems. When would you like to stay at Holiday Inn Hotel & Suites Chicago - Downtown? This suite features a kitchenette, complete with a microwave, refrigerator and tea and coffee-making facilities. A sofa bed and free Wi-Fi are included. A spacious sitting area and 2 TVs are also provided. This air-conditioned room features free Wi-Fi, cable TV, tea and coffee-making amenities and a sitting area. Free Wi-Fi and a 32-inch flat-screen cable TV are included in this 2-room suite, along with a sofa bed and microwave. This room features free WiFi, a 42-inch TV, refrigerator and a microwave. A bathrobe and slippers are provided as well. An iPod dock is included. This room features a private entrance, iPod dock and air conditioning. This room features free WiFi, a 32-inch TV and a refrigerator. A desk and iPod dock are provided as well. House Rules Holiday Inn Hotel & Suites Chicago - Downtown takes special requests – add in the next step! Holiday Inn Hotel &amp; Suites Chicago - Downtown accepts these cards and reserves the right to temporarily hold an amount prior to arrival. Holiday Inn Hotel & Suites Chicago - Downtown accepts these cards and reserves the right to temporarily hold an amount prior to arrival. Please note that guests under the age of 18 are not permitted to make a reservation at this property. Text messages frequently asking about stay. My room key didn't work the last night I stayed and I had to wait in line with my 1 yr old for about 20 minutes to get it fixed. When the card reader on the elevator stopped working and asked where the stairs were to walk up to my room, was told there were no stairs. The room was a lot smaller than I expected it to be, making it a little cramped for my 1 year to be able to play. The parking , and some of staff didnt give us the right info. Cleanliness of the bathroom. Tile and bathtub needs updating. New beds were very comfortable. Parking was not mentioned when booking, hotel charges $50 a day. However there is parking right next to the hotel for $20 a day. Everything ! The booking process so easy! Property needs upgrade, not worth the rate that was charged. very close to the CTA blue line and greyhound bus station. The hotel is on a unique land site Parking is available, but a bit difficult - valet or the adjacent lot.